Rainwater is recognised by the New South Wales (NSW) state government as an important resource for water sustainability. As such, they often encourage or mandate the adoption of a rainwater harvesting system and better use of rainwater. BASIX (Building Sustainability Index) is a state-wide environmental planning initiative that applies to all residential dwellings in NSW and is a mandatory part of the development application process. It lists certain environmental “sustainability targets” that new property developments must attain. How you handle achieving those targets is to some degree left up to you, but in other cases certain features (like installing a rainwater tank if you have a swimming pool) may be mandatory. According to BASIX, a new home is required to use up to 40% less potable water than the average home ‘pre-BASIX’. BASIX came into force 1 July 2004, and the average home back then used an average of 247 litres per person. So the new target is approximately 148 litres per person per day. 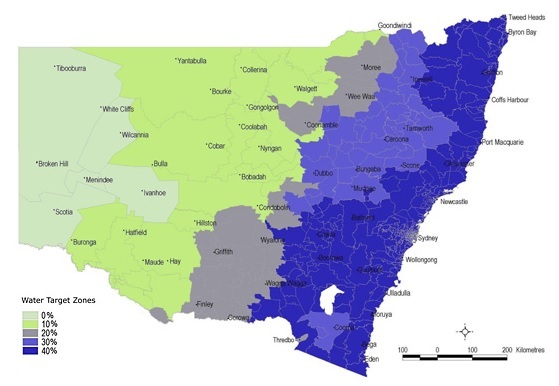 The water reduction target varies according to the different climate zones in NSW (refer to the map below). Homes closer to the NSW coast, comprising the majority of new residential development, usually have a 40% target, about 100-300 kilometres inland have a 20-30% target, and further into rural inland areas 10% and even 0%. Rainwater – captured from the roof of your home, garage or sheds and stored in a rainwater tank. This water is suitable for toilets, laundry, gardens, hot water and all other household uses. Stormwater – captured from trafficable surfaces such as pavements and ground surfaces and stored in a stormwater tank. This water is suitable for garden irrigations, but requires treatment to be used for watering edible plants, flushing toilets or for laundry. Greywater – reusable wastewater captured from the laundry, bath, shower and bathroom basin. Greywater must not contain human excreta like faeces and urine (so hopefully no one pees in the shower!). Kitchen wastewater may be included if treated as it may contain food particles, oils and fats. This water is suitable for garden irrigations, but requires treatment to be used for toilets and laundry. Private dams – can be used to harvest water suitable for toilets, laundry and gardens in single dwelling developments only. Dams nominated as an alternative water source for BASIX must be exclusively for household use. Reticulated recycled water – this is non-potable water supplied by a water authority (usually treated sewage effluent, greywater or stormwater). This water is suitable for garden irrigation and toilets, however some recycled water schemes allow connection for laundry also. Hot water diversion – this involves capturing the initial burst of cold water that comes out of your facet when you turn on your hot water into a “hot water diversion tank”. As it is only a small amount, this water is only suitable for toilet flushing. While alternative water sources are optional, most dwellings will need to nominate some form of alternative water source in order to achieve their required BASIX water target. National Poly Industries can help you to achieve your water target with water tanks that will nicely complement your home. We can advise on the most economical solution for your needs if you are looking for rainwater or stormwater storage tanks.